This 5ft x 3ft Waltons Shiplap Mower Store is the perfect storage solution for keeping your garden tools neat and tidy. Fitted with large double doors, this storage building has been designed to give you easy and hassle free access to your lawn mower or garden machinery. 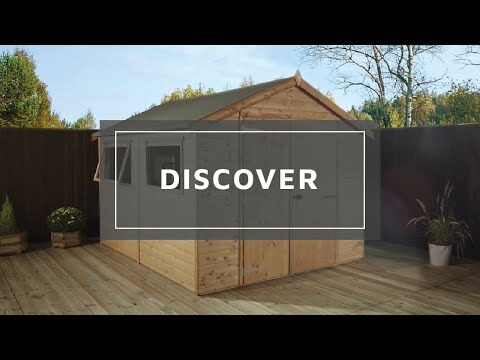 It can also be used as a simple outside storage shed, ideal for smaller gardens. Thick12mm shiplap tongue and groove cladding make this an extremely robust wooden store and is supplied with a pad bolt for security. The floor and roof of the store are made from solid sheet board, offering a sturdy platform for storage. The roof of this mower store features a pent design to prevent a build up of rain water and is supplied with quality roof felt to protect against weather damage. Review:This was a 4 x 3 shiplap mower store. Good value for money. The suggestion is it requires 2 people to erect it but in fact it can be done by one. Thank you for letting us know that you're pleased with your Mower Store and that you found the product to be good value for money. Great to hear your installation was straightforward and you could manage with one person! Review:Product is - as advertised. It is great to know that you are happy with the quality of your mower store and I thank you again for your review. I am thrilled to know that you are highly satisfied with the quality of your shiplap mower store and I thank you again for your great feedback! Review:Looks good but weather not allowed me to erect it yet. Oh no! We hope the weather subsides soon so that you can enjoy your mower store. We are happy you like the look too. Thank you for taking my call earlier and I’m glad you have been able to resolve the issue you experienced during the building of your new Mower Store. I am pleased to know that you are very happy with the shed overall and I thank you for your feedback. Review:The quality of wood is very high and the fixtures and fittings robust. The instructions clear and concise. Everything it said on the box and more! Our Reply:I am glad that you are happy with your mower store and feel your purchase is of high quality. It is also great to know that instruction were clear and easy to follow. Thank you again for your feedback. Review:Easy to assemble and does the job? Review:very happy with the product . Our Reply:It is great to know that you are happy with you tongue and groove shed!